Every week we add new really good templates for websites to our website. If you want to receive up-to-date information, subscribe to our newsletter! Play School is an Education WordPress theme which caters to e learning, school, university, online courses and other educational websites like kids, kindergarten and other such websites. Designed and developed with lots of colorful icons and sections the homepage loads itself fully with all the content as shown in the demo. For various sections simple custom post types have been set up within the theme which can be used easily to populate sections as you wish for. Since schools require calendars and online timetable we have made it possible with plugin compatibility with various timetable and calendar plugins. SKT Perfect is a perfect WordPress theme which can be used for any type of commercial websites. This multipurpose premium commercial WordPress theme is super flexible and scalable. Comprises of several fantastic supporting themes which provide super customization options and great custom different designs which are not just unique but cater to various industries and types of websites. Portfolio websites can be created easily with the help of several slider compatible plugins, internal gallery included with the theme and as well as other gallery plugins which are compatible with the theme. A professional-looking layout with effective presentation of all products is a must-have for a successful online shop. Book store WooCommerce template will help you start one easily. Valid coding and comprehensive documentation will help transform this design to meet the needs of the particular online business you need. It can be hobbies and crafts, gifts, fashion, music, and sport online stores. Its easy on the eyes responsive layout will perfectly suit any of the aforementioned spheres. Soft color scheme, various sliders, audio and video integration, HTML plus JS animation work as strong triggers of this theme, making it engaging for the viewers, thus offering all products in the best possible way. Jv Blog is a simple, clean, personal, modern and professional blog Timeline ideas for spreading your stories. Numerous trending Blog timeline, pretty headers, modern Masonry layout, multiple creative slideshows or post 3D impressive effect will be absolutely ideal to attract your readers. Jv Blog allows user interact with many different parameters and options: Logo options, easy to add Google Font. With RTL language support, Optimization, SEO included… all the most powerful feature in order to increase your site’s visitors and move on higher ranking. Coupon WordPress Theme is a beautiful and professional theme built from the ground up for the coupon business. 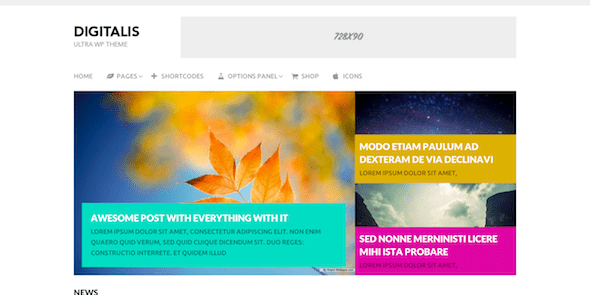 Impress your visitors and convert more sales with this highly professional and fully customizable theme. The best theme for selling coupons, full stop! Coupon theme looks uniquely impressive and works beyond expectations. It has an excellent homepage design and an even better coupon details page. WooShop has a beautiful design and it is intended for an immersive user experience. You can sell your real products with it, or you can sell digital goods and subscriptions. Three types of grid layouts are included with the homepage to customize it to your heart’s content. There are banner slots available you can use to promote the most valuable products/offers as well. Increase Sales With a Modern, Responsive and Highly Professional WordPress WooCommerce Theme. Fully Responsive HTML5 & Review based WordPress Theme! 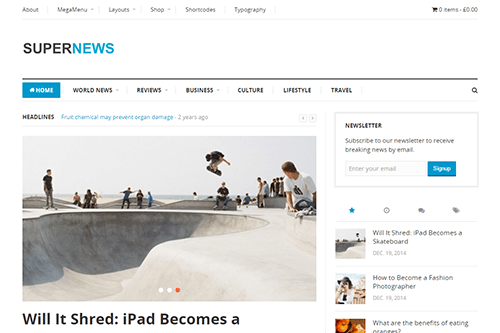 Take your blogging to the next level with Splash, a HTML5 WordPress theme that integrates review blogging and maximizes content impact. 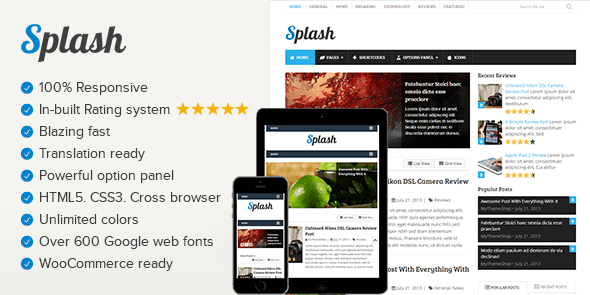 Splash theme is one of our most versatile WordPress themes and it has helped hundreds of bloggers create review websites that not only rank well, but they have a very high CTR in Search Engine Result Pages because of the review schema added to blog posts. It is coded with speed and SEO in mind and it won’t disappoint you on either front. Ad-Sense detects use of ad blocking software on a visitor’s device and that triggers a popup asking them to stop blocking ads. You can even set it up to hide your content until they whitelist your website. 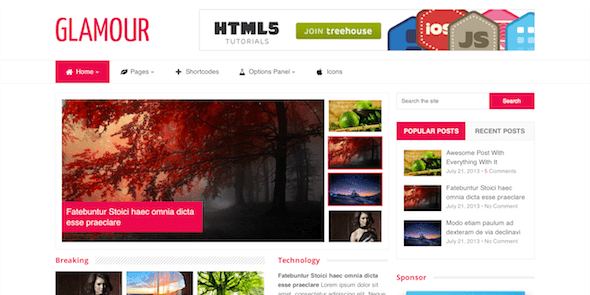 Digitalis WordPress theme is a Multipurpose, Clean & Colorful Theme. Digitalis is a multipurpose WordPress theme by MyThemeShop with a clean and colorful design and lots of contrast. With blog, magazine, and WooCommerce functionality,is a multipurpose WordPress theme by MyThemeShop with a clean and colorful design and lots of contrast. Digitalis has the features to help build a successful site in any niche. It includes custom icons, shortcodes and much more. Responsive themes help your site work on any browser and device, regardless of screen size, and Digitalis is fully responsive. Glamour WordPress Theme is a Beautiful & Minimalistic Theme. It elevates minimalism with a splash of color. With a multiple column post display, clean design that includes a splash of color, and the ability to customize almost everything, Glamour is a great choice for bloggers who want flexibility, speed and elegant minimalism. Glamour includes 6 Homepage layouts and 3 Single Post layouts to choose from, giving you the maximum flexibility to customize your site. Immunity WordPress Theme is a Unique Blog WordPress Theme With a Creative Design and Tons of Features. It is a multipurpose Responsive WordPress theme that includes Magazine & Blog layouts, Post formats, Woocommerce integration, Custom Widgets, ShortCodes and tons of features. Perfect for any type of site, whether it’s video blogging, breaking news, or eCommerce, Immunity is optimized for speed, search engines and advertising. You’ll see more visitors, more pageviews, more ad revenue and sales. 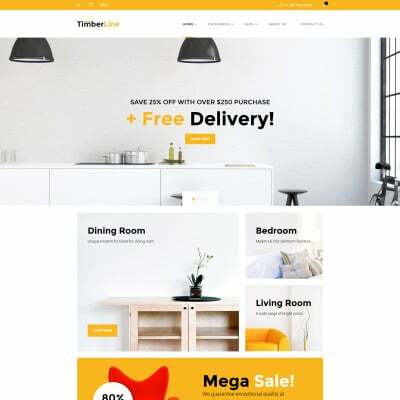 Timberline – Furniture Store is a WordPress theme that comes integrated with WooCommerce. It will let you run an online shop out of the box. Thanks to its fully responsive design, you can sell to users of mobile devices. In terms of functionally, this clean eCommerce theme has many features to enhance your product showcase. With a built-in carousel, you can display multiple items compactly on the page. 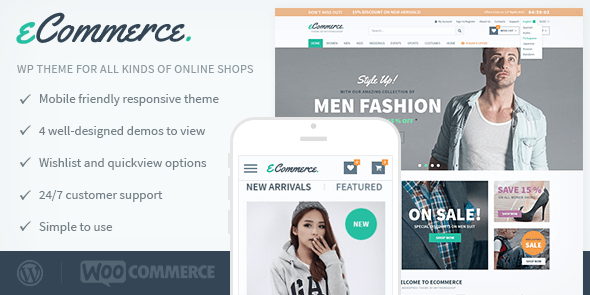 Showcase Your Products Beautifully & Generate More Sales With Multipurpose eCommerce WordPress Theme. eMaxStore is a beautifully designed eCommerce theme that can serve multiple purposes. It can help you showcase your products and generate more sales, and it also includes an beautifully designed blog that means it can either be a standalone blog or part of a large eCommerce website. Clock is a magazine and WooCommerce WordPress theme that draws inspiration from traditional journalistic and news sites. Focusing on crisp typography with great contrast, Clock makes your content easy to read and engages your readers with interactive features that are sure to please. Sydney Pro takes the power of our free Sydney theme and supercharges it – enabling both freelancers and businesses to create a fantastic looking website quickly and easily. Sydney Pro comes with support for the free and amazing plugin Crelly Slider. Using Sydney Pro, you can quickly add a slider created with Crelly Slider to the header of your site and impress your visitors. Perth Pro comes with support for the free and amazing plugin Crelly Slider. Using Perth Pro, you can quickly add a slider created with Crelly Slider to the header of your site and impress your visitors. Rocked Pro expands the already powerful free version of this theme. Rocked Pro comes with support for the free and amazing plugin Crelly Slider. Using Rocked Pro, you can quickly add a slider created with Crelly Slider to the header of your site and impress your visitors. Adds many new exciting features on top of the already powerful free version. West Pro comes with support for the free and amazing plugin Crelly Slider. Using West Pro, you can quickly add a slider created with Crelly Slider to the header of your site and impress your visitors. Six extra Live Composer modules are available in West Pro. You’ll find modules for Google Maps, Youtube video gallery, contact info, pricing tables, timeline and single video. 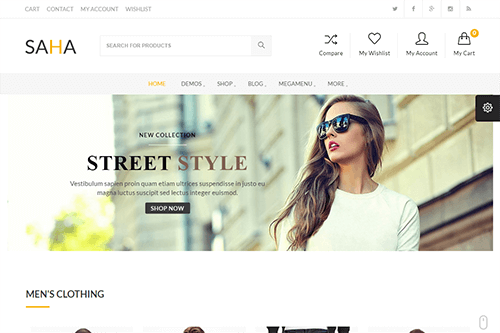 eCommerce is a beautiful, modern and professional-grade WordPress theme by MyThemeShop, that’s ideal for eCommerce sites. The amazing layouts will help you to start making more sales immediately while the advanced features like wishlist and quickview options will give you even more ways to package your products and satisfy your customers. 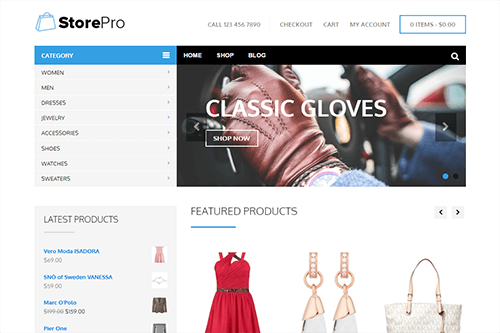 StorePro is the fully featured ecommerce theme you’ve been waiting for. Use the featured content slider to display your articles in an auto-scrolling slideshow. Make it easier for your visitors to find your best content, read more of your articles, and view more of your adverts or products. Setting up the featured content slider is easy, making this a powerful tool for increasing page views and potential website revenue. FireUp is a multipurpose theme that’s ready for any project, including creating ecommerce stores. LayerSlider, included free, makes showcasing your products and images simple. Choose from dozens of different slide transitions, sizes, and styles. It’s a superb way to put your product front-and-centre, and capture the attention of your future customer! SuperNews is the flexible, feature rich theme that’s ready for any project. Use the integrated page builder tool to construct custom layouts for your content, all through a user-friendly interface. Simply drag and drop the content blocks and widgets into position to create the perfect layouts for your content. Your custom layouts will always be fully responsive to cater to mobile users. The minimal ecommerce theme that will help sell your products online. 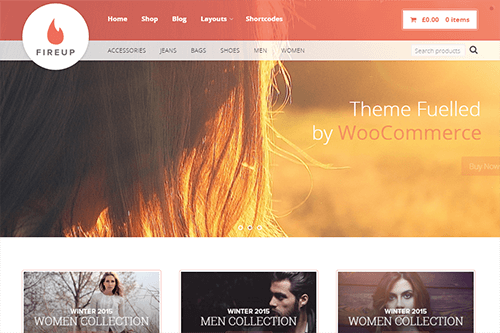 WooCommerce is the leading ecommerce store builder plugin for WordPress and this theme has been built to take full advantage of this tool. Thanks to this, every aspect of your store, including the product listings, individual product pages, and shopping cart and check out pages will share a stylish design with the rest of your site. 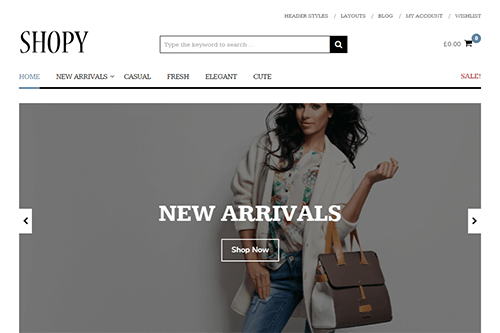 A modern ecommerce theme with a selection of layouts to help you promote your products in style. Tagcloud-The best Themes and Templates for websites: HTML5 themes, WordPress themes, WooCommerce themes, PrestaShop themes, OpenCart themes, Drupal templates, Joomla templates, Magento themes, FREE themes templates. © 2005 - 2019 Copyright W3Design.mobi. All Rights Reserved.